After last weeks excitement of a beautiful wooden puzzle made by a newcomer, we are back to a puzzle by the geniuses at Puzzle Master. Having had so much fun with one of their wire puzzles which had a short loop of string within it, the Eagle, I felt inclined and courageous enough to take on another one with string in it (not a long length however. This time it is Derringer - so called because of it's resemblance to the small handgun. It is a level 10 (out of 10 - Mind Boggling) puzzle which should always give you a small hint of concern but I was on a roll! What could possibly go wrong?? It consists of the gun shaped piece which is effectively one single long looping segment of wire with the ends joined together by a ring. Threaded through that loop is a small section of string ended by 2 large balls. Further confounding the movement is the ring of wire around the string. It is 9.5 x 5.4 cm and like all their own brand puzzles, it is beautifully finished. The puzzle has received an average rating on the Puzzle Master site of 4 stars but this is purely due to one individual marking it down (incorrectly I believe). The other 2 puzzlers found it rather tough but enjoyable (5 stars). As far as I can tell none of the regular puzzle bloggers has reviewed it before. I solved it quickly, but I felt as if I had forced it, so I spent almost 2 hours looking for a no force no bend solution. I gave up and peeked at the solution only to find that I had done it right all along. Enjoyable, but it should have been better made. Let me categorically say that I downloaded the solution and whilst it is slightly different to my own approach, there is NO force required and definitely no bending of parts with either solution - I have no idea why they felt this was needed. I started it last Wednesday (1st May) and managed to get it quite knotted really very quickly! With my heart in my throat I fiddled about and managed to return it to the beginning without too much difficulty - I do sometimes wonder whether these are bad for my health! Whilst at work I gave it to a friend who managed to do something odd to it and he couldn't return it to the beginning! Whilst trying to undo the knots he had left me, I somehow managed to solve it! It just came apart in my hands! Of course, I had absolutely no clue how it came apart because I hadn't done most of it myself! In fact I couldn't even remember the small part I had done. This meant that when trying to put it back together again I just manage to knot it up! In the end I actually had to spring the wire to return it to the beginning. Blush! Later that day, I managed to solve it properly and reassemble it but was not sure how I achieved it! Why is it that I always say that I will pay attention to the process but absolutely NEVER manage it? I started again in the evening and this time just looked at it properly, making small movements back and forth trying different things. This quickly showed me how to achieve something very interesting and from there it was an easy one to solve. Analysing it properly this way revealed that there are actually not that many possible/sensible 1st moves. Having tried a couple of them, it was easy to see when one led to an interesting conformation which easily led to the solution another 3 moves on. String separated from the gun! If you analyse the solution properly like that, then it is easy to reverse it as well but if, like my first time you just fluke it then it is probably even harder to return to the beginning than the initial solve. Another interesting feature is that my solution is slightly different from that given by Puzzle Master in that the key moves are done in a different order. There must also be at least one more method of solution because the very first time I did it, it came off from a totally different exit point. All in all, I really enjoyed this one, I think the difficulty rating of 10 out of 10 is a little high, it should probably be a 9. But it is one of those unusual puzzles that needs to be solved by analysis rather than random fiddling. At $10 in price it is a bargain and is well worth your money. 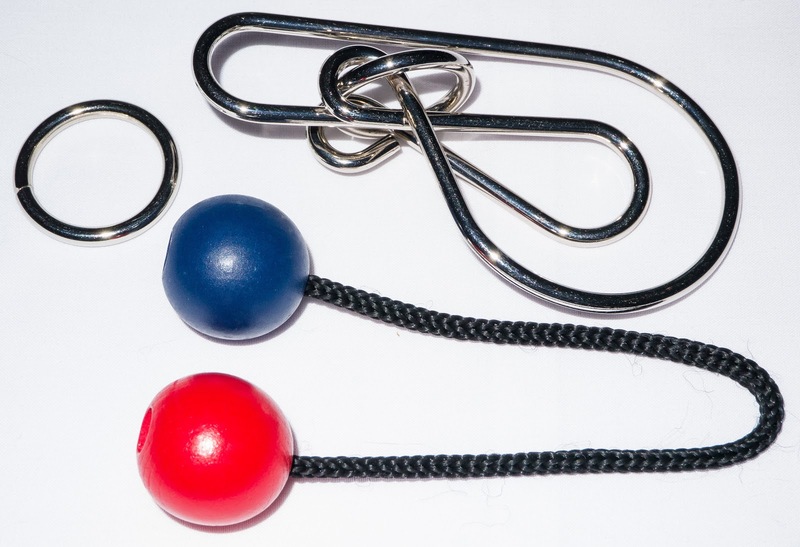 I am going to keep taking it to work and tormenting my colleagues with it - it never gets knotted so badly that I am anxious about letting someone else play and can be solved by accident by the newbie giving you the wicked ability to taunt them when they fail to reverse the process. What purpose we use the derringer! Its look like beautiful and enjoyable to use that puzzle.